Check-out these recent repo sales figures across U.S.
Repo sales auctions will be catching boat buyers attention in 2011 as they stand to save a minimum of 50% off book value. The same boat their neighbor bragged at only having paid $20,000 can now be bought anywhere south of $9,000-10,000...often for much less. When the economy worsens, boats are among the first things that consumers surrender as they struggle with home mortgage payments and less available home-equity financing. According to National Liquidators, one of the largest boat auction companies in the U.S. boat auction sales have doubled from the year previous. 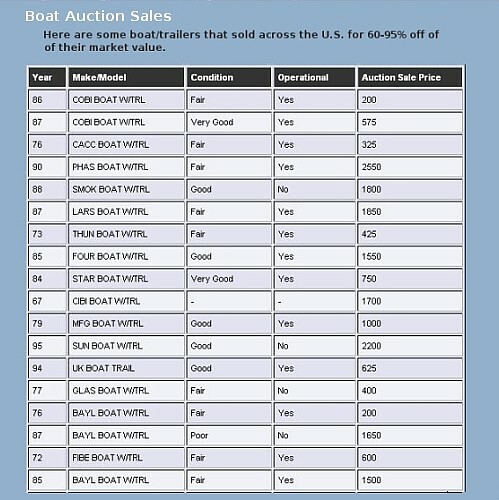 A recent auction sales sheet provided by BoatAuctionsDirect.com shows some of the recent repo sales auction stats across the U.S. in 2008. Auction Sales Figures Across U.S.
Update: Check out the latest repo boats sales stats.